In 24 years of handling automobile warranty cases, I have heard a number of remarkably stupid things said to me by those who defend the auto manufacturers. I don’t blame the manufacturers: When a lawyer says something stupid, it’s on them. And it’s this week’s podcast. Lawyers are often asked to defend difficult positions. Some do it by thinking up novel defenses. And some just say stupid stuff. I know this is probably true in other fields. There is probably an accountant or a doctor out there, right now, saying something incredibly idiotic. But lawyers are supposed to make sound arguments. Believe it or not, the rules of ethics even require it. “Meritorious Claims and Contentions” are required of attorneys in Michigan (and in most states), making much of what I am talking about here unethical. Unfortunately, courts view a lot of this as a grey area and rarely act upon it. Instead, they - like me when I hear it - simply look askance at the person making the dumb statement. 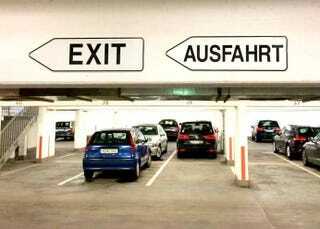 The top pic, of course, is a German parking deck’s exit signage. It is funny to some juvenile English-speakers. Like me. Steve Lehto has been practicing law for 24 years, almost exclusively in consumer protection and Michigan lemon law. His Dodge Daytona & Plymouth Superbird: Design, Development, Production and Competition was published last week.